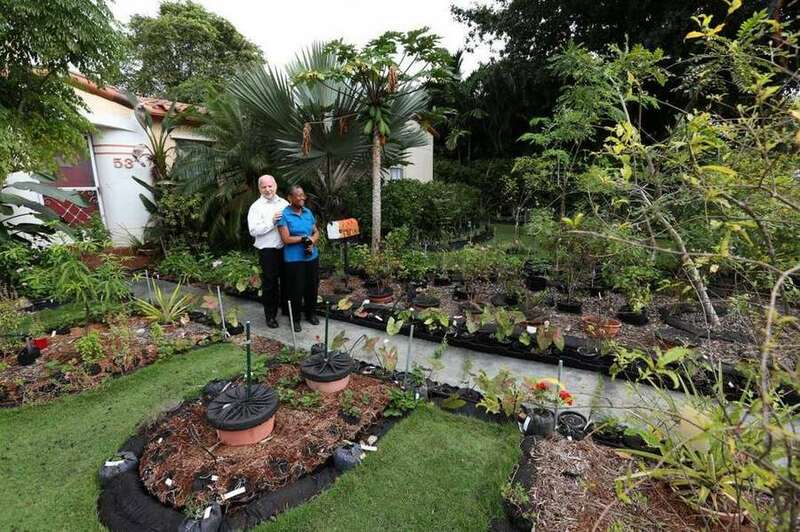 Tom Carroll and Hermine Ricketts stand in front of their home at 53 NE 106th St., Miami Shores, Florida, in November 2013, when the couple maintained a front-yard vegetable garden. The House tended to the “vegetable garden bill” for the first time Wednesday, as the bill made it through the first of three stops on its way through the Legislature. Rep. Elizabeth Fetterhoff presented her amended version of bill to the House Local, Federal and Veterans Affairs Subcommittee, which prohibits a county or municipality from regulating vegetable, fruit and herb gardens on residential properties and voids any existing ordinance of that nature. At the beginning of the month, the Senate Community Affairs Committee unanimously backed the measure, which was first filed by Sen. Rob Bradley. The Senate passed the Fleming Island Republican’s bill during the 2018 session, but the clock ran out and a House version was never filed. The vegetable garden proposal stems from a legal dispute about a Miami Shores ordinance that banned the gardens from being planted in front yards. Village residents Hermine Ricketts and Tom Carroll kept a garden, and were charged $50 in daily fines. They eventually had to dig up their 17-year-old garden, which they kept because their backyard didn’t get enough sun to support their beets, kale, tomatoes and Asian cabbage. The couple sued, and in November 2017, an appeals court upheld a ruling that they do not have the right to keep a vegetable garden in their front yard. They appealed the ruling to the Florida Supreme Court, which declined to grant review. The DeLand Republican added that limitations also curb possibilities for reducing food deserts, supporting the long-suffering bee community and teaching children about how vegetables grow. The bill does not include rules set by homeowners associations and does not affect other properties like schools and churches. The main opponent to both vegetable garden bills is the Florida League of Cities. The group’s legislative counsel, David Cruz, argues that each city in Florida is unique, and much of the unique aesthetic is brought about through code enforcement. That’s why Coral Gables looks different from Perry, Florida, he said. Cruz said bills like this one preempt local laws, and gave the example of a 2013 Orlando ordinance that allows residents to use 60 percent of their front yard as a vegetable garden. Rep. Anna Eskamani was the only member of the subcommittee to vote down on the bill. Home rule is her “north star,” she said, and the smallest level of government understands their community best. “We worked together at the local level to pass an ordinance that did the people good,” the Orlando Democrat said. “City officials and county officials should bring this up at town halls, on Facebook, talk to their constituents. If there’s a rumbling that folks want this, make it happen on a local level. She said she would support a bill with amendments that provide clarity on what constitutes a vegetable garden and give local power to defining its size and aesthetic. Fetterhoff said she plans to keep working on the bill as it moves through the process, but fundamentally believes the vegetable garden restrictions in places like Miami Shores step on citizens’ constitutional rights. The bill will be heard in the House Commerce Committee and State Affairs Committee, but the dates have not yet been set.